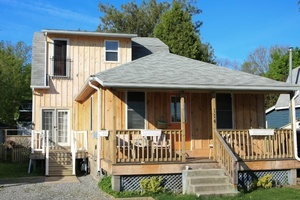 The cottage is nestled directly across from where the Niagara River meets Lake Ontario, offering a beautiful view of the water and its surrounding landscape. It is adjacent to the Whirpool Jet Marina, and only a five minute walk from the Old Town’s main strip: Queen Street. This offers close proximity to a variety of boutiques, restaurants, the Shaw Festival Theatres and several sight-seeing locations. The main floor includes 1 bedroom with a double bed and a pull-out sofa in both the living-room and common sitting area. It also includes an open concept kitchen, living/dining room combination with a gas fireplace, full bathroom with shower, and a door leading out to the backyard deck and BBQ grill. The loft suite on the second floor is charming and spacious with a King-size bed, pull out sofa-bed, TV and bathroom with Jacuzzi.